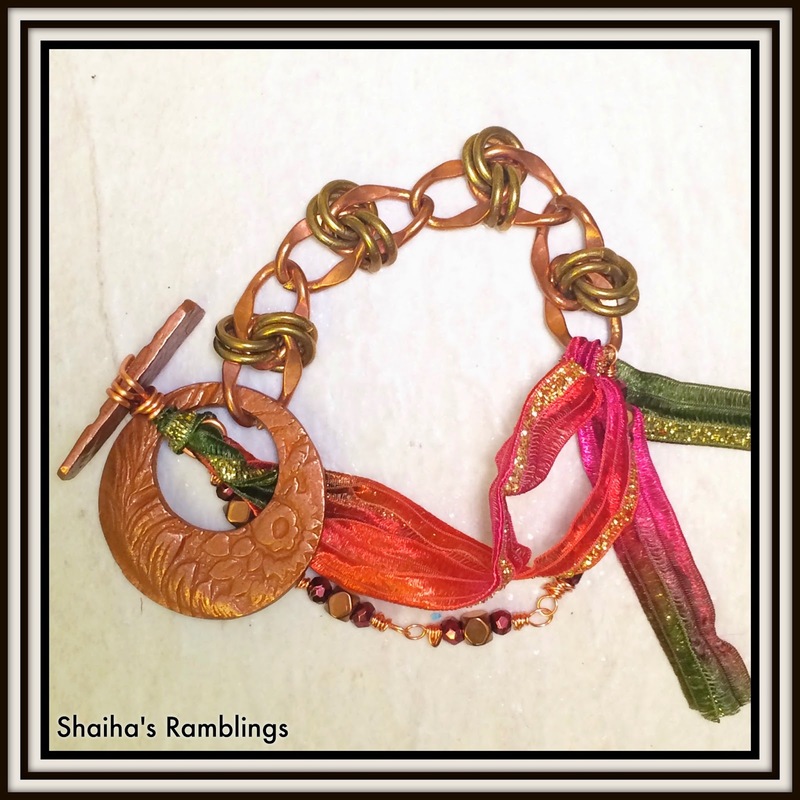 I try to participate in at least one big jewelry blog hop each year because they are so much fun. 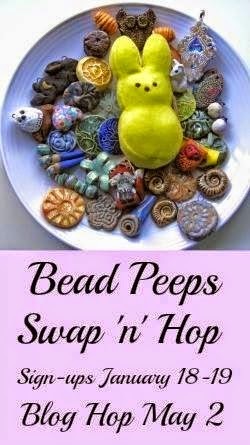 This year it is the Swap N Hop where we are partnered up with another designer, we send them some beads with at least one item being artisan and then we get to show off what we made. Today is that reveal and I was actually lucky enough to have two partners so I have a bit to show off. My first partner is Sue Kennedy of Sue Beads. The picture above is a reminder of all the beady glory that Sue sent my way. Just love all the varied colors and those clasps. Sue just happened to be out of clasps so she hurriedly whipped some up. Dang. Wish I had that ability. I immediately fell in love with the heart focal that Sue made that was my first project. I knotted it together with some vintage lucite beads, copper spacers,a copper charm to echo the flower imprinted on the heart and one of those lovely clasps. Next up was that ceramic ring which happened to be the only artisan goodie I received not made my Sue herself. 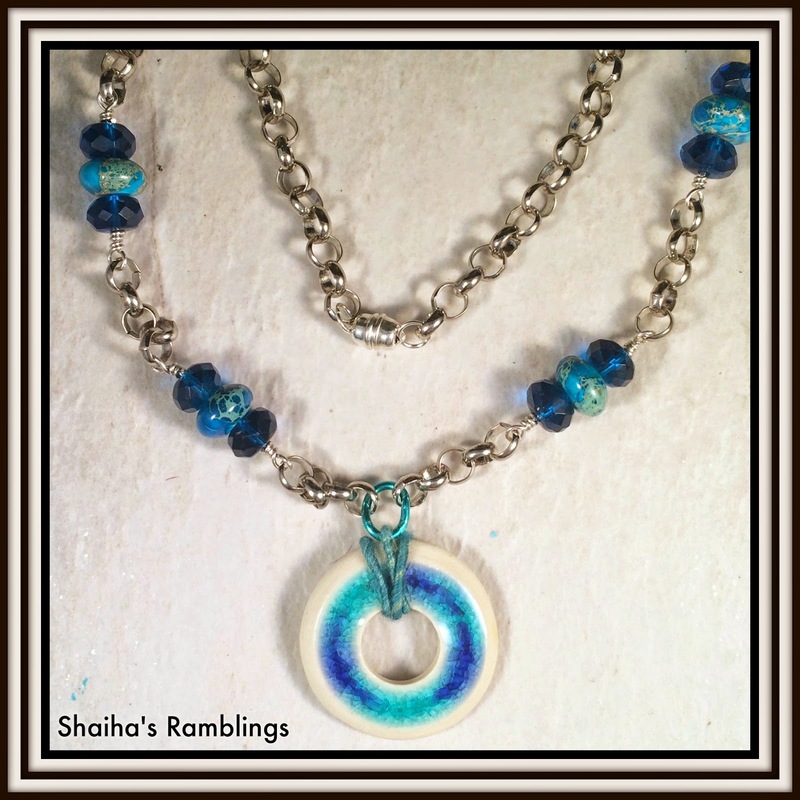 I used those gorgeous lampwork spacers as well as the blue crystals what went so well with the beautiful blues. I wired wrapped into together with a silver rolo chain and used some Wooley Wire to make up a bail. 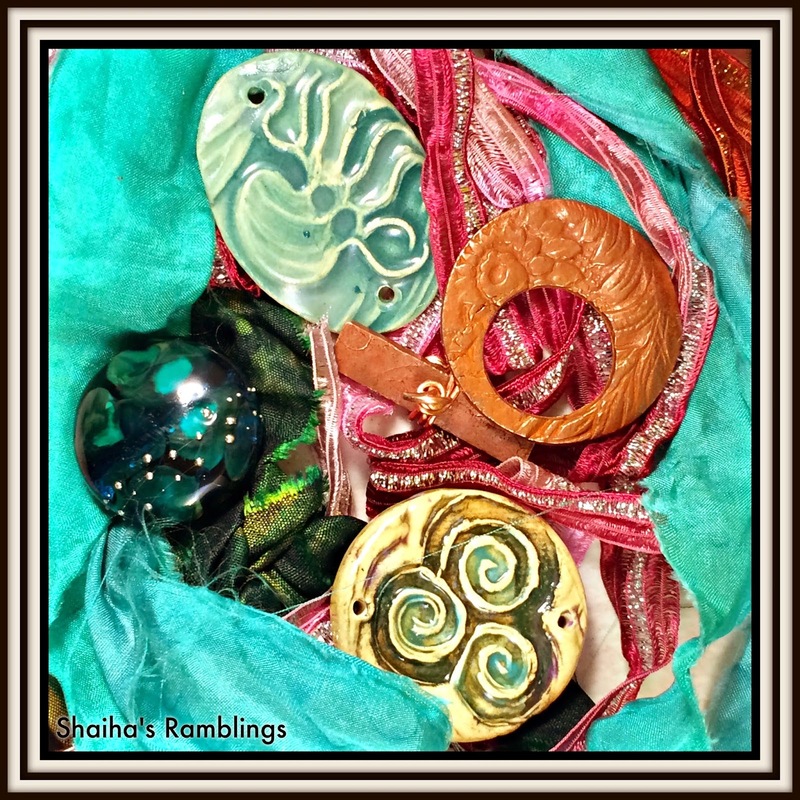 And now for my second partner who is Lee Koopman of Strega Jewelry who I am so glad I got to meet through this blog hop. Lee has so much in common with me it's scary. I was so spoiled by both of my partners. Just check out all the beadiness sent to me by Lee. I am especially in love with the bracelet bar she made for me. I didn't use it yet as I am waiting for the supporting cast to appear. I got a real kick out the fact that Lee says she can't do up pretty packages so she tied everything up with pretty ribbons. That is so like me. I always love getting a surprise in the mail all decorated up but I can't do that to save my life. Besides I really liked all the ribbons. I ended up using one of those ribbons along with the handmade clasp to make this bracelet. I also make up a beading chain of faceted pyrite. 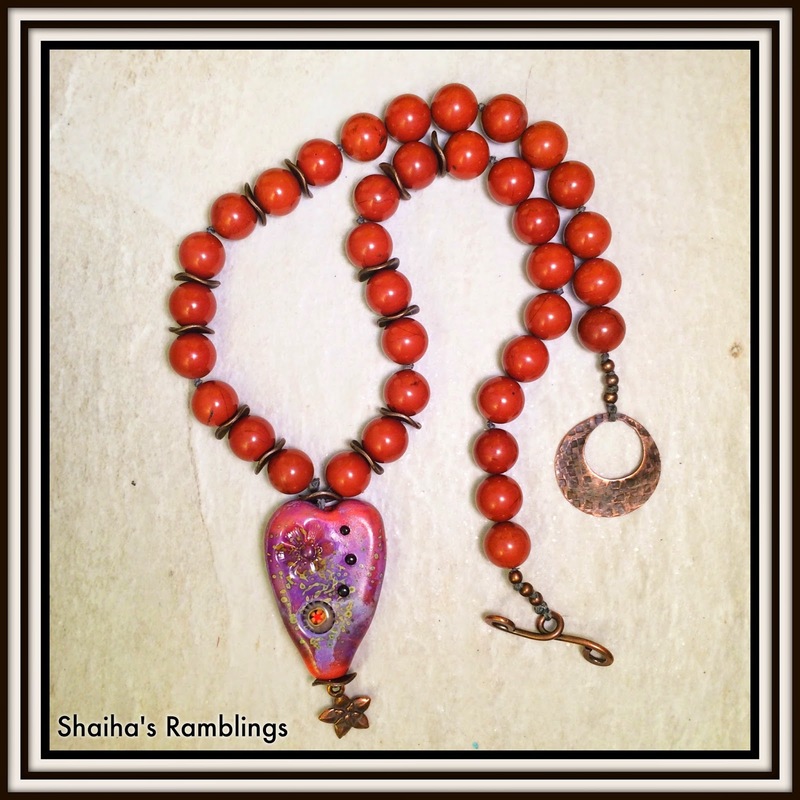 Since we both share similar spiritual beliefs, I wanted to make up a necklace to celebrate that fact. 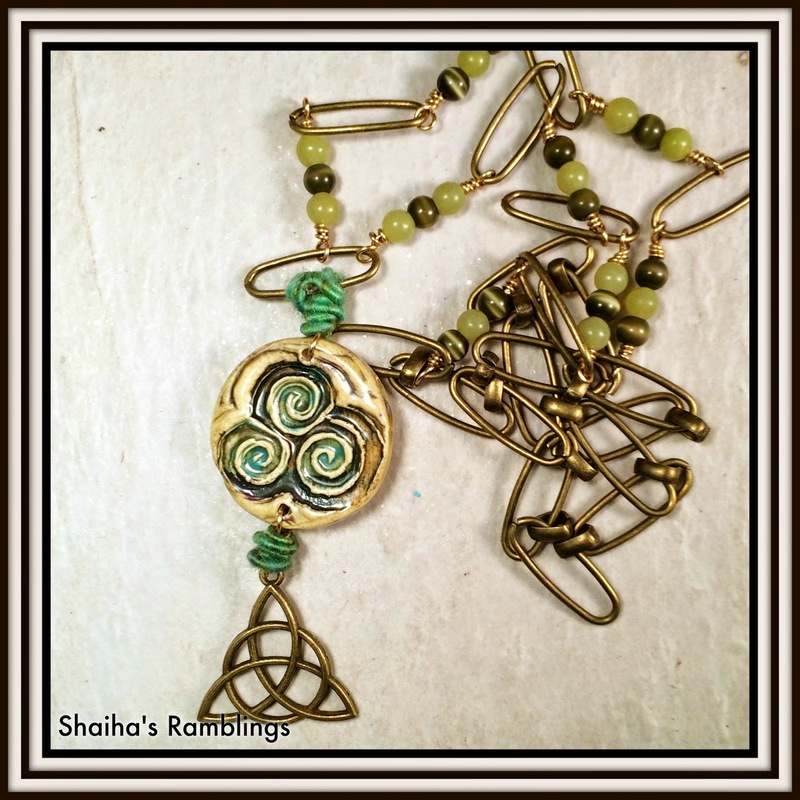 I used the rustic threefold ceramic focal along with the serpentine beads that Lee sent me. I added in some brass chain, a charm and some Wooley Wire. The last piece that I made was rather simple but this focal was so gorgeous, I really wanted to let it have its place in the sun. This is a longer necklace that you can just slip over your head and go. The rules said that I needed to use up all the artisan pieces that we received and I failed in completing that part of the challenge but I was so blessed by my partners that I just flat ran out of time. Things have been hectic around here since we are in the process of purchasing our home. Actually we just purchased it since everything went through on Thursday. Anyways you will see the rest making an appearance later. Now I did say that I was running a contest now didn't I? Just be sure to leave a comment and I will be drawing a winner on May 19th for that last necklace. 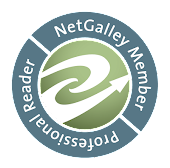 Now since this is a hop, be sure to jump around and see all the wonderful eye candy that the other designers have come up with. Just click here to go to the list off all the designers. 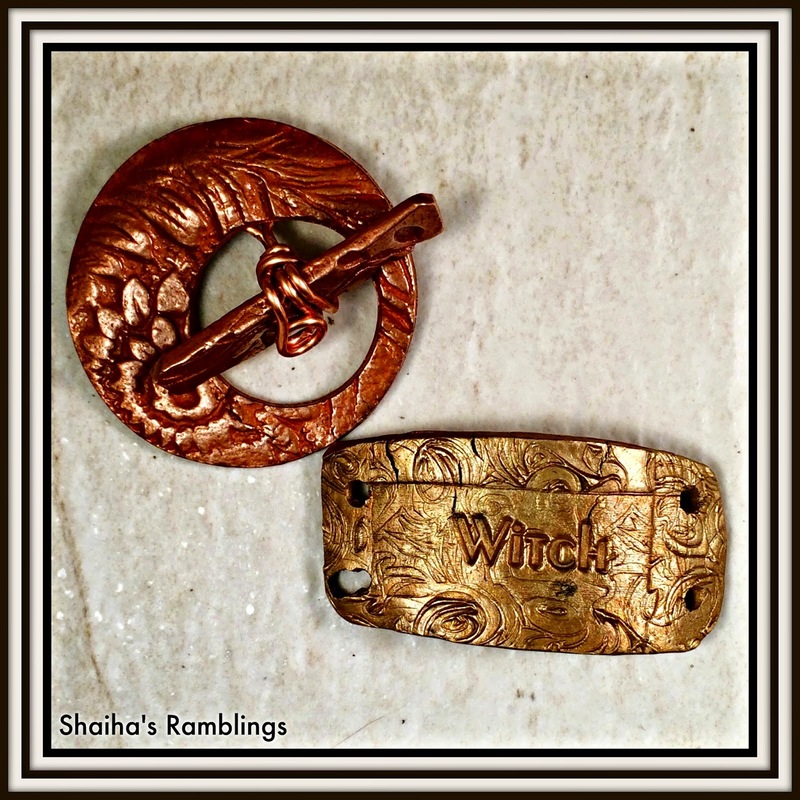 Hi Shai - awesome pieces! I love what you did with my heart, too, it's so awesome! You got great beads from Lee as well. Thanks so much for being my partner! Great job Shai. I would have a hard time picking a favorite because they are all beautiful. Thanx for the giveaway. Shai! I am amazed that you got anything accomplished at all what with two partners AND closing on your home. You must have been over the moon with that going on and I would have found it difficult to focus on anything else........so much to do, so many plans to make....! I really like that heart focal from Sue and those colors you used are just perfect to set it off. Also glad you used my wrapping "string" which is actually sari silk ribbon and meant to be used for beautiful things. Yes we do have so much in common it is uncanny. I'm glad you are waiting to use the bracelet bar until you find the perfect "partners" for it. It wasn't necessarily part of the hop but a gift to you for becoming my "witchy" angel. You did a great job with Jeanne's Celtic focal. The serpentine beads most definitely matched it but the woolly wire and triskele made it POP! Yes, and yes again for the tassel with the lamp work focal! It shows it off perfectly! Hey, put my name in that drawing! LOL I love her work and that bead is one of my favs of the beads she makes. You made some beautiful things. Well done! Oh wow!!! So much eye candy going on here. You did your partners proud. Amazing amazing designs. I'm especially loving that bracelet because I like asymmetric and fibers. Great job! And all the best with the move. You and me are in the same boat. We're moving soon too. Shai - they are all wonderful. I would be hard pressed to pick a favorite. Very nice work! Wowza! Beautiful pieces. I love them all! Oh how lovely and colourful and happy these pieces are! Great work! 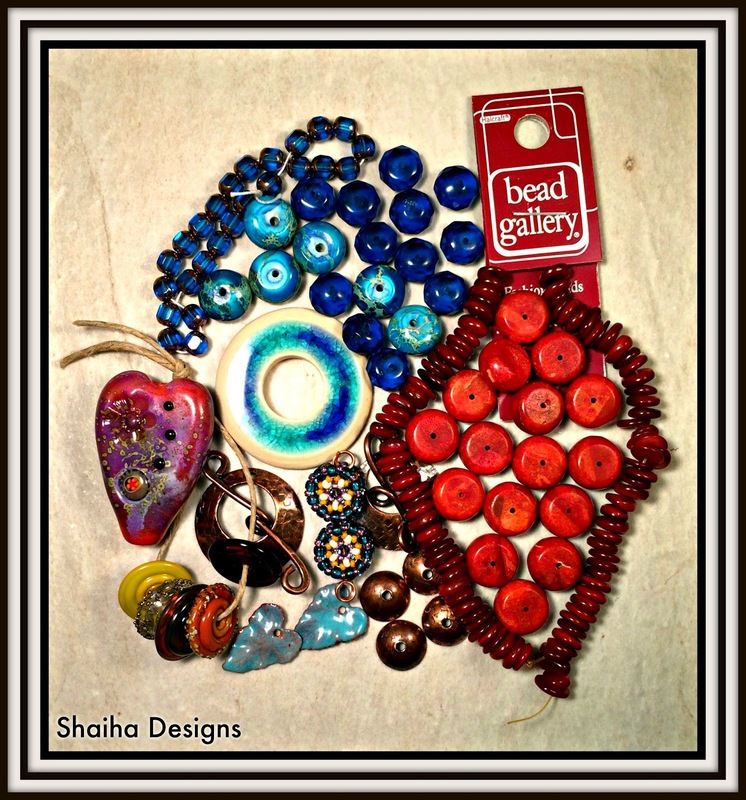 Amazing creations from some wonderful beads. The hassle focal necklace is beautiful and your tri focal necklace is beautiful. I adore how you made the heart focal necklace with the gorgeous copper clasp. You were very lucky with your partners. Not surprising you didn't have time to use everything. :) The pieces you finished are lovely. 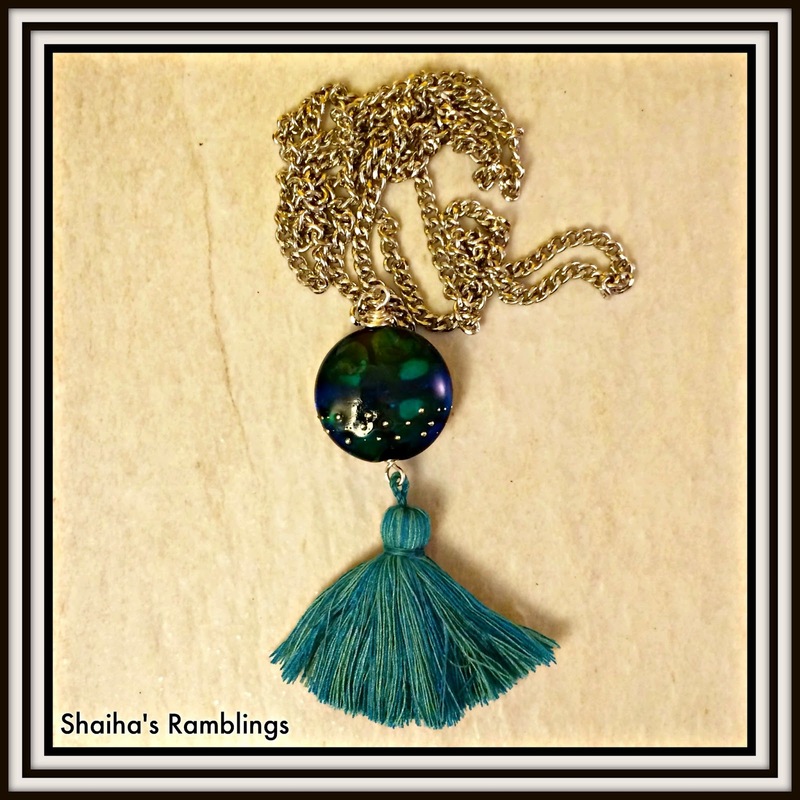 Even though I'm not a big hearts fan, I do love the colors and design of the first necklace. And each of your designs have great combinations of color and texture. Gorgeous designs. Love them all. Beautiful job! I love the fibers bracelet! It reminds me of gypsies and Esmerelda! Love it! Oh my goodness, Shaihai, you really did receive an amazing collection of beadie goodness. I would have had problems deciding what to use because there was just so much gorgeousness from both of your partners. You really hit it out of the park with all of your designs! They are all so rich and colorful with all the fabulous colours and textures. Your style and talent really shines through in these pieces. Thanks for visiting and for your kind comments. You're right about the soldering. Just one of my future challenges! It's so fun to see all the great beads you got from your two partners, and wow - you made great use of them. I love all the necklaces you made. The bracelet is great - I love that you used ribbon from the wrapping. I'm always thrilled when I can do that too. that blue donut is gorgeous! and you highlighted it to perfection! The red beads with the heart was unexpected, but picked up those undertones so well. The first necklace and bracelet from Lee was also wonderful - I really liked the chain interspersed with the sparklies! Oh wow where to begin! You have such amazing collection in beads from your partner, and you`ve designed each one to be a stunner! 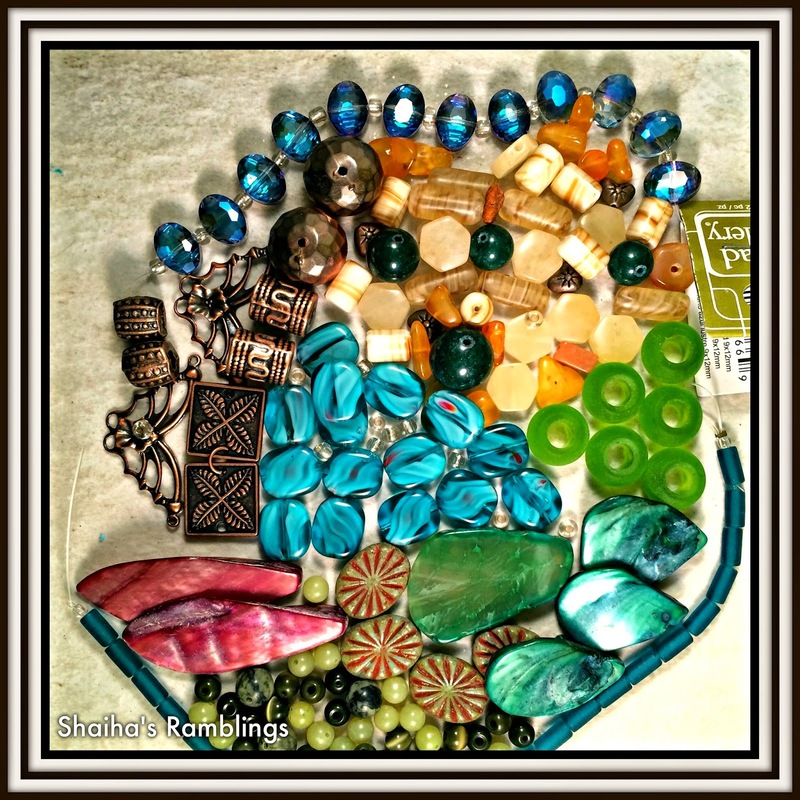 I love the way you have used different textures and color in your collection. What beautiful work. You lucky gal having 2 partners. I can't wait to see that bracelet bar in action. I confess...I am bit jealous over your two great partners and haul of beady goodness ;) I'm such a lover of Sue's beads and that bracelet bar Lee sent you...LOVE IT! Oh wait, I'm supposed to talk about your designs...well you know I love them too! I love your style and this round is fantastic as always. I really love the spiritual necklace. It definitely speaks to me. Boy you were really busy.. Love all your pieces and you got some great stuff to work with !! Faascinated by your styling. How lucky to have to wonderful partners ! Enjoyed the pictures and descriptions. Inspires me to reach outside my current comfort zone and be a little more adventurous. All your creations are awesome! The fancy chains and connectors have added their own charm where used. Mixing in some wooly wire and ribbon gives some new texture to the pieces! So love the patience necklace u made for me lov the jasper!!!!!! thax!!!! !